This course is being updated soon. You can join us live online for the recording of the new, Electron v2 workshop. Talks about the origins of Electron, Steve reviews the scenarios where building a desktop OS over a web application. Steve discusses applications that use Electron. Explaining the technology makeup of Electron, Steve illustrates the benefits of Chrome Content Module and Node without the programming headaches for building an application on open web technologies. 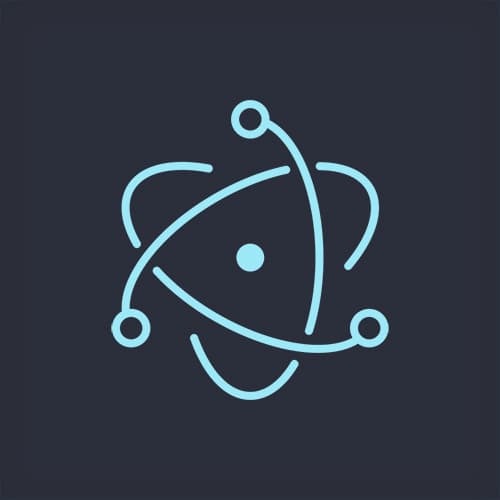 Demonstrating the capabilities of an Electron application, Steve walks through installing Electron and setting up a simple application. Steve continues to showcase Electron capabities by building a small, proof of concept application for MacOS. With the basic application framework in place, Steve demonstrates the modules available for quickly building out an app in the main process. The main process is the part of application code that communicates directly with the underlying operating system. Steve shows how Electron allows combined access to application file system and the DOM. To open a URL in the user's default browser, Steve shows how Electron can handle URLs using the `shell` module. Steve shows how to configure an Electron application's main typeface to the default OS's font by setting the CSS font property to a value of menu. Using Electron's dialog module, Steve codes a feature to call a native dialog box to open a new file from the user's file system. He also demonstrates OS integration by showing how to animate the dialog box to slide into view. With Electron, Steve shows how to limit the type of files the application can open by adding filters to the dialog box. While loading files and logging to the terminal is possible, Steve uses the remote module to send the content over to the render process. Steve shows how to have the main render communicate with a render process to open and display files in the user's operating system. Then he takes questions from students. Steve refactors his code example for displaying a file. While making sure the new dialog box opens in the correct window, Steve shows how to allow different files to display in multiple windows of the markdown text editor. Steve shows how to set the title of the window to the name of the filename. Also, he provides visual cues by placing the file icon next to the filename and visually notifying the file as edited on the MacOS' app window's menu bar button. Steve builds out a prompt to warn users to save their file before losing changes to their file. To determine a file change, Steve codes an update keep track of the original content of a newly opened file and compare it to the user's file to see if any changes have been made. Steve provides support for file edited visual cues for Windows and Linux by appending "(Edited)" in the title bar. If a file has been edited, Steve codes the Save and Revert buttons to be enabled. To select previously opened files, Steve uses an “open-file” event that can listen in the main process and then be made to spawn a fresh window. Triggered by the rendering process, Steve codes a function in the main process to save a file. Steve incorporates a file watcher. When a file's contents change in another editor, then that change is reflected in our application. Besides web page looking buttons, desktop applications typically have a menu bar with options like File, Edit, View, etc. Steve shows the defaults for menu bar items that Electron provides. However, if you want a customized menu, however, the entire menu needs to be re-created. Overriding the default menu that Electron provides, Steve sets out to create a custom menu bar by first recreating the default functionality of menu bar through an array of menu items. Accelerators (keyboard shortcuts) and roles can also be assigned and customized depending on the user's built-in OS functionality to provide a more natural user experience. Steve highlights code sections of a menu bar application. Steve packages up the Fire Sale application for distribution. Demonstrating how to include a customized application icon, Steve rebuilds the packaging of the application. Concluding the workshop, Steve takes various questions from students and thanks them.